On the page devoted to the Martingale system we assumed that this system, regardless of its simplicity and indisputable logic, may be very tricky due to two reasons. First, we need quite a large capital, i.e. we must be prepared to risk a lot of money in case a long losing series appears, since doubling of bets grows stealthily from the beginning, but soon goes through the roof. Note: Roulette has been virtually created for the Martingale strategy, however it – and thus the results of this test or simulation as well – can be used for other gambling games with even-money bets, i.e. those with the payout 1:1. Secondly, even more fundamental factor consists in the betting limits, which are applied by a vast majority of casinos. The lower is the limit of maximum bet, the fewer times we can double the bets until we hit the limit. Anyway this assumption shall be proven by this first grand test of the Martingale system. The betting limits may correspond to a stone casino: the minimum (even-money) bet is $5, the maximum is $500. "Spin #" reaches from 1 to 100,000. For each spin a random winning "Number" is generated (the color of the number sticks to the Roulette rules and is determined automatically). We start with a $5 "Bet": if we win, we start over with $5 bet again; if we lose, we double the bet in the next spin. 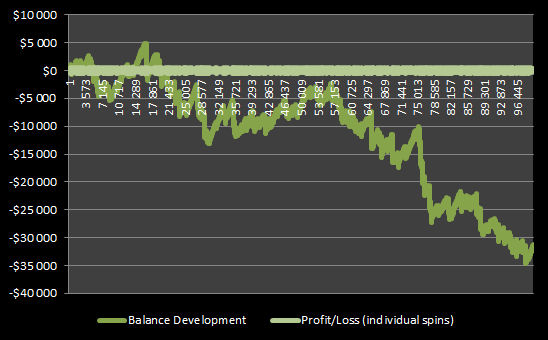 "Profit/Loss" shows the net outcome of the spin and it is added to the "Balance". The balance represents our capital and its development throughout the test of the Martingale system with limited bets. The initial balance is set to null as different players may dispose of different capital. The balance is net so it can be easily added to or deducted from each individual capital. In this test we suppose we have got enough money to finish the test.. The balance is the most important indicator of the test, both its final state after the spin no. 100,000 and also its development during the test – that is best caught by the chart (see the figure 1). The horizontal axis (x) represents the spins, while the vertical axis (y) shows the balance (darker green curve) and net profit/loss in individual spins (lighter green curve). The lighter green curve almost turns into a line, but it will start "moving" in the Martingale system test with unlimited bets. 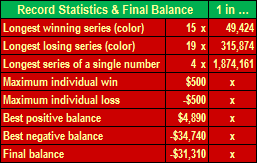 The chart shows that even with a few dollars in a pocket (we start with a $5 bet and a zero balance, however if we get into the negative balance, we must dig into our pocket to be able to bet again) we would win about $2,500 after 3,500 spins. Then, however, there was a decrease in our balance, which fell into a loss of about $5,000. 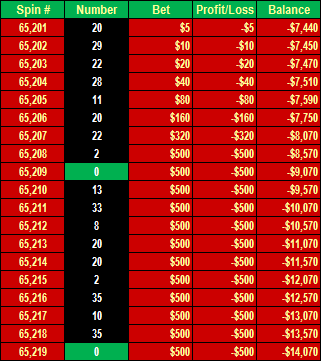 He who endured, with a good dose of luck, would achieve reversal and the maximum positive balance of $4,890 (the exact figures are shown by the Table 2 – see below). Then, after a decrease and a little swing to the plus, there is steady decline, which is unfortunately the typical course of events if you play the Martingale system with limited bets for a long period of time (or a great number of spins). Once fallen into negative balance, it is very hard to climb up, as (1) the probability always goes against us (18 red numbers win, 18 black numbers and zero lose), (2) we cannot double the bets in full due to the maximum bet allowed. If e.g. we are in the loss of $5,000, we can make only $500 bets, which means that we would have to win several times in a row to erase the loses. The final balance after 100,000 spins is -$31,310 and evaluated at the end of this article. Meanwhile we can go through interesting statistics that came out from the test of the Martingale strategy. 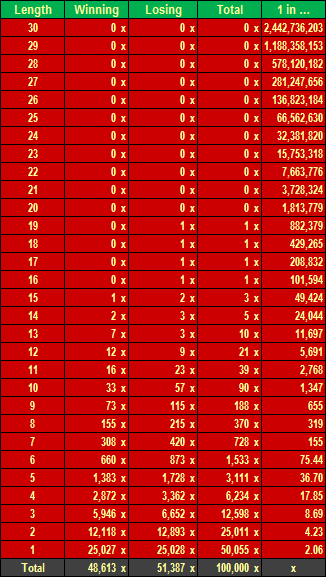 The simulation of the Martingale system based on 100,000 spins and limited stakes (min $5, max $500) brought a lot of interesting statistics. A losing number, either a black number or a zero, appeared in 19 consecutive spins! That was the longest losing series of the test. The probability of such event is very low, precisely (19/37)19 or 1 in 315,874. The number after "1 in ..." is considered to be the fair odds for this event. The same single number appeared came out four times in a row. There were actually two such events. Number 3 came out in four consecutive spins # 31,705 to 31,708 and also number 36 appeared four times in a row (spin # 91,033 to 91,036). The probability for a single number to come out four times in a row in only 1 in 1,874,161. Hypothetically if you bet $1 on a single number and added the win to the bet, after four spins you would win more than $1.5 million (35 ˟ 35 ˟ 35 ˟ 35). You might be also interested in record Roulette series registered in real casinos. All frequencies of winning and losing series are shown on the Table 3. We can see that there are many more-than-ten-long series. There are more losing series, of course, as they include not only black numbers but also zeros. We know that the longest losing series took 19 consecutive spins. 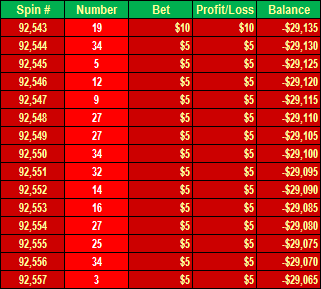 The best or winning series took 15 spins (red color appeared 15 times in a row). The probabilities or the odds of the winning series are shown on the column "1 in ...". The odds for the losing series would be lower due to a zero. There is precious information included in the Table 3. The most frequent "series" was 1; that means that the colors alternated. Then it holds true that the longer is the series, the lowers is its frequency. Last but not least we can see that the number of losing series exceeds the number of winning series and altogether they make 100,000 spins. The longest winning series took 15 spins and appeared at the end of the test – see the table 4. We can notice one substantial detail: we do not earn too much in case of a long winning series. As if we win, the "series" ends and we start over with the minimum bet. We do that to keep room for doubling of the bets in case of losing spins. On the other hand, anytime we break the losing series, the result is that we get all the money back plus the minimum bet so that our balance out the losing series makes $5.. Note: the first bet of this series (spin # 92,543) is $10, because the previous stake lost and thus the next bet must have been doubled. The longest losing series took 19 spins as shown by the Table 5. We can see that the stakes are doubled after each lost spin and that, thanks to the maximum $500 bet, we could double our bet in full only seven times. This unsuccessful series would cost us $6,635. However that is nothing as compared to the game with unlimited bets. In that case it would cost us unbelievable $2,621,435 (!). 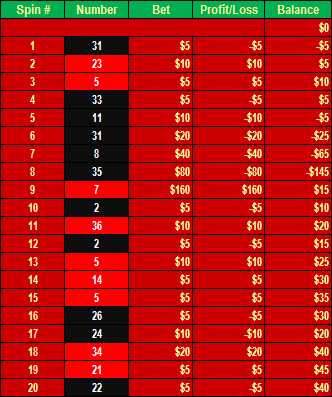 The sequence of the doubled bets after $320 would continue as follows: $6,400 - $1,280 - $2,560 - $5,120 - $10,240 - $20,480 - $40,960 - $81,920 - $163,840 - $327,680 - $655,360 and $1,310,720. At the beginning one would not say how high it can climb up, what do you think? It is necessary to realize that doubling of bets grows exponentially. 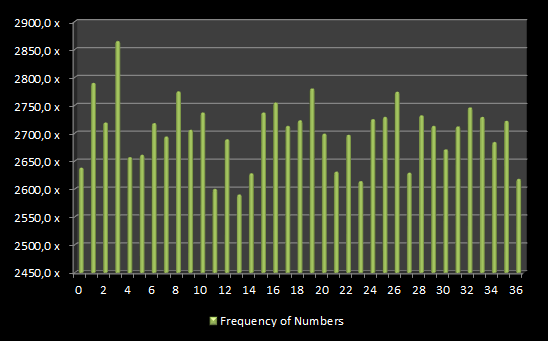 The next figure shows the frequency of each individual number in this Martingale test. It shows how many times each number came out. The frequencies should be about equal as each number (0–36) can appear with the same probability (1/37). An imaginary winner is number 3, the least frequent was a superstitious 13. The first grand simulation of the Martingale system proved that the limit of maximum bet is also a limiting factor for a long-term success of a player using this strategy. The final balance -$31,310 speaks for itself. The simulation using MS Excel could have been carried out over and over again and it always finished with a negative balance. It would actually be a surprise if it ended differently due to the house edge. Despite you can win at the beginning (see the figure one – balance chart), even quite a lot if you are lucky, the more you play, the likely the house edge will prevail. This test based on the 100,000 spins proves that. It also holds true that the earlier you hit the long bad series, the harder it is to make it back to the positive territory. It would require a great deal of luck as the bets, due to the limit, cannot be doubled infinitely. The second test of the Martingale system with lower minimum bet (and thus bigger room for doubling) provided better results. The test of no limit Martingale will be brought in near future. This article also aims at refuting "guaranteed" earnings that are promised by some unsound websites. Although you can win in Roulette, it is hard (not to say almost impossible) to be in the black in the long run, while "guaranteed" earnings are a clear nonsense as casinos would not exist.